LM-12 In photo S72-38433, you can see an Apollo 16 mission emblem on the Capcom console. The Apollo 15 mission emblem can be spotted on the Capcom console in photo S71-41836. Also, ASTP emblems were on the Flight console during that mission. They look like decals to me. Any other mission emblems on the consoles? spacemal There is an image of MOCR activity on page 120 of Skylab; Our first space station (SP-400) that shows the Apollo 17 patch - if you look carefully! LM-12 Can't quite make that one out. But I do see the Apollo 17 emblem on the Flight console in photo S72-54881. LM-12 Is that the INCO console? The Flight console ASTP emblems I mentioned earlier can be seen in photo S75-28683. LM-12 Did the Capcom console location move from the third row to the second row after Apollo 17? It seems to be to the right of the Flight Director's console in some Skylab and ASTP photos taken in the MOCR. Skylab and ASTP used MOCR-1. Apparently, the Capcom console location in MOCR-1 was different than the location in MOCR-2. 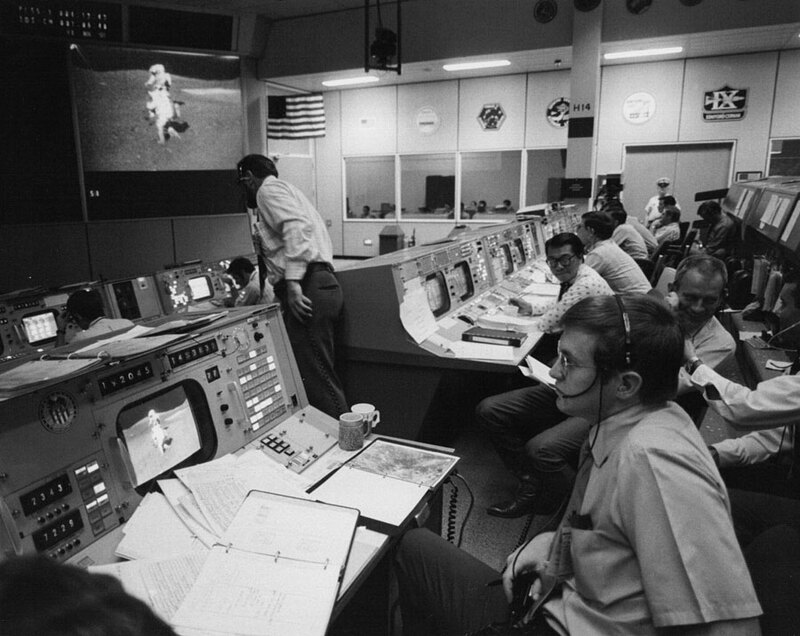 Note the ASTP sticker on the console. LM-12 Apollo 7 also used MOCR-1. Ron Evans was a Capcom during the mission. LM-12 The Skylab 3 crew placed a mission decal at the Apollo Telescope Mount (ATM) console on the Skylab space station. LM-12 All three Skylab mission emblems can be seen on the Flight Operations Director console in photo S73-37747. There are three Skylab emblems on the Capcom console (behind Henry Hartsfield at right) also. LM-12 The Skylab II emblem on the console near the phone is the wives' version of the patch.